Using your natural stone field tile (granite, marble, travertine, slate), American Bullnose Company manufactures bullnose tile. By engaging different polishing wheels, we obtain the same finish on the bullnose edge as the field tile. Below are the benefits of using American Bullnose Company, and the options available, to you, our customer. All bullnose is machine profiled to assure consistency from piece to piece. The final polish is done by hand to attain uniformity. Our prices are comparable or less than other manufacturer's of natural stone. We can customize bullnose to your size specifications. Each bullnose edge is finish matched to the field tile. 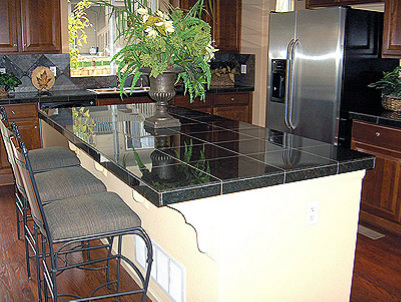 We can apply several different edges to your tile including, bullnose, flat polish and bevels.